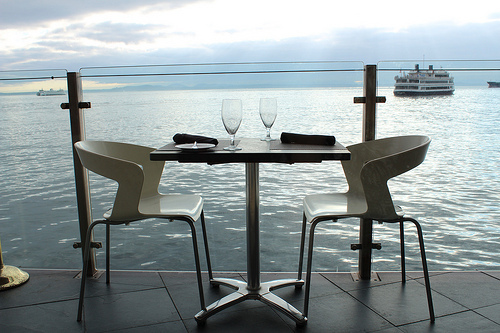 Perched on the edge of Pier 67 in the famous Edgewater hotel is the elegant Six Seven Restaurant. The Edgewater, built after the World's Fair in 1962, is the city's only waterfront hotel. Inside are breathtaking views of both the Puget Sound and the Olympic Mountain range. You're so close to the water you'll want to drop in a fishing line right over the side. In fact, the Beatles did just that from their suite in 1964 (read more about the hotel's history here). Whether you're a local or a tourist you'll find the sophisticated yet approachable Pacific Northwest cuisine of Chef John Roberts deliciously inspiring. Specializing in local and seasonal ingredients, and incorporating many secret family recipes, Six Seven is no stranger to accolades: 2012 Top 10 Scenic View Restaurants (Open Table Diner's Choice Award), Best Wine List, Best Restaurant, Best Fine Dining (Best of City Search), to name just a few. In 2009, Six Seven was one of five featured Seattle restaurants at our International Food Blogger Conference, so we thought it was high time we pay a visit, especially after the hotel's recent multi-million dollar renovation. We were more than pleasantly surprised by both the decor and the cuisine. Here's a peek at what we dined on, but check out their full dinner menu as the decisions were tough! 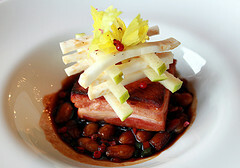 We started with the Five Spiced Duroc Pork Belly that featured an impressive log cabin-like stack of julienned Washington apples on a bedding of red pepper, cannelini beans, celeriac, celery leaves with a sweet and spicy soy sauce (left). To cleanse our palates after the richness of the pork belly we had a Wild Arugula and Local Pear Salad with a Dijon white balsamic and Port wine vinaigrette, candied walnuts, and - what caught our eye - a Rogue Creamery Oregonzola. For our entrées we went with fish, though there were some tempting choices in the "Land" category such as Sage Brined Skagit Valley Chicken with Full Circle Farms organic baby vegetables, and a Harris Ranch Filet Mignon crusted with that lovely Oregonzola a forager mushroom ragout, asparagus, potato crisp, and natural jus. (That one was tempting!). 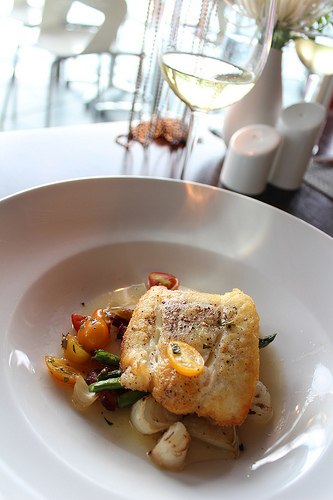 Barnaby chose the delivered-fresh-daily local halibut pan roasted with chipoline onions, asparagus tips, bacon lardons, artichokes and a cherry heirloom tomato tarragon salad. Tender, flaky and perfectly cooked. 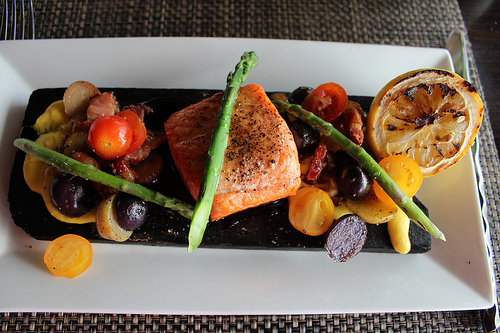 I selected the Cedar Planked Salmon with rainbow potatoes, forager mushrooms, pancetta, tomato, asparagus, truffle cream and blackberry honey. A veritable seasonal cornucopia of oh-my-God amazingness. Served on the blackened plank on which is was cooked this salmon had a buttery texture and smokiness that was truly heaven sent. And, gorgeous to look at! If ordering multiple courses as we did I recommend going with the half size portion for your entrée. It's still a good sized entrée and you may just have a bit of room left over for one of their fabulous desserts. We shared a Rosemary Scented Panna Cotta with Chianti huckleberries, vanilla whip and biscotti and a glass of Taylor Fladgate 20 Year Port. If you're a Port or Sherry imbiber, you'll love their nice selection. 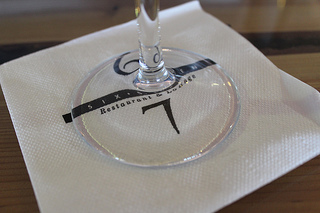 Six Seven is open for Breakfast, Brunch, Lunch and Dinner. They also have a terrific Happy Hour Sun. - Thurs. from 3pm-6pm. Each day features a different fun Beatles-mania cocktail. Day Tripper, anyone? Editorial disclosure: We were invited to sample the seasonal menu by the Six Seven team. When I realized the next day that my photos all had corrupt files and were beyond useless I returned two weeks later with my friend, unbeknownst to the staff. I'm happy to say that the service and meal was just as amazing as when we had been their guests. Consistency is a beautiful thing! Thank you for your kind words! We're so happy you could join us to celebrate our seasonal menu, and we are thrilled that you enjoyed your meal… We certainly enjoyed your company! We hope to see you again soon!